In this January 2015 file photo, Gov. Paul Lepage celebrates while taking the stage at his second inaugural in Augusta, as Speaker of the House Mark Eves applauds. AUGUSTA, Maine — In a final attempt to give his successor a raise, Gov. Paul LePage unveiled a proposal on Wednesday to more than double the next governor’s pay and increase meal and housing allowances for legislators. 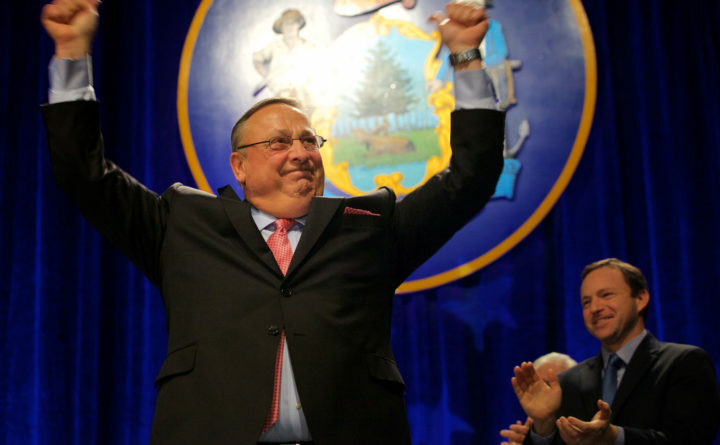 LePage is now paid $70,000 per year, which makes him the nation’s lowest-paid governor, though that doesn’t account for the Blaine House — the governor’s mansion — along a $35,000 expense fund that can’t be audited by the Legislature and other benefits of state service. The new proposal, sponsored for LePage by Rep. John Martin, D-Eagle Lake, would raise the governor’s salary to $150,000 starting in January 2019 — when LePage leaves office and the governor to be elected in November moves into the Blaine House. LePage has long bemoaned his low pay relative to other governors and his salary is less than $3,000 above Maine’s mean household wage, according to the U.S. Census Bureau. Governors made just over $137,000 on average in 2016, according to the Council of State Governments. The Republican governor’s last effort to raise his successor’s pay in 2016 was linked to shrinking the Legislature and was poorly received and quickly killed. Now, he is trying to pair it with a hike in compensation for legislators. His bill would raise the daily housing allowance from $38 to $75 and a meals allowance from $32 to $50. LePage said in a radio interview last year that while he would allow a gubernatorial raise to pass, he was “tending to lean against” raising the next governor’s salary, saying he felt there was “good” in taking a lower salary to serve the public. LePage also unveiled his 2016 proposal in March, just before the end of the Legislature’s short session in even-numbered years. That timing makes anything less likely to pass. Four sitting legislators — including three of five Republican leaders — are running to replace LePage.